Negev, the southern desert that covers more than two thirds of the Holy Land, is terra incognita to most Christian pilgrims who visit Israel. Some journey as far south as Eilat to visit the traditional site of Mt. Sinai, but even these travellers usually have no idea that the Negev desert is also worthy of their interest. They are unaware that that desert is rich in history and archaeological remains from its Christian period – that is, from the mid-fourth century to the end of the seventh century. The book is divided into eleven chapters. 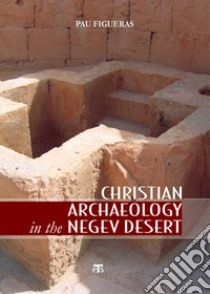 In Chapter One the author discuss the Nabataean history of the Negev and the Roman annexation of the region. The final chapter reviews the Muslim invasion of the southern desert in the seventh century C.E. and how this impacted the Christian population there, finally causing its disappearance. Chapters Two to Ten deal with each of the major Byzantine settlements that have been excavated, offering a full record of the discoveries concerning Christian archaeology together with pertinent references to ancient texts and local inscriptions. A good number of photographs will illustrate the text.